As cottagers sipped lemonade on the shores of the Ottawa River near Britannia on a hot July afternoon, relaxation turned to terror as they witnessed the tragic crash and sinking of a 100 foot flying boat. Five of the seven man crew perished that warm summer day as their flying boat quickly sank under the glassy surface of Britannia Bay. 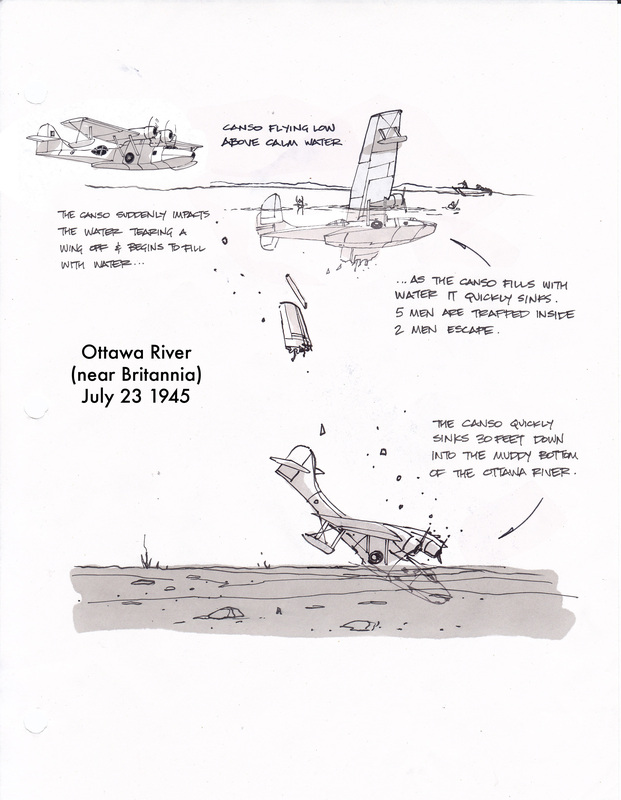 Trapped inside the sinking hulk of the Consolidated PBY-5A Canso, it would only take five minutes for the men inside to be taken to their watery grave at the bottom of the Ottawa River. Map showing approximate crash site of the PBY Canso July 23 1945. 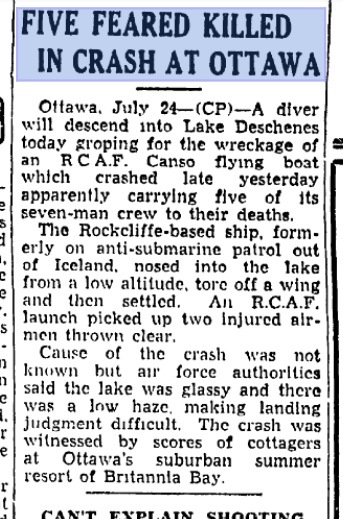 Original 1945 Toronto Star newspaper article reporting the tragic crash near Britannia. It was just after 3 o’clock on a hot, calm July 23 in the year 1945 and the waters of the Ottawa River were as smooth as glass. 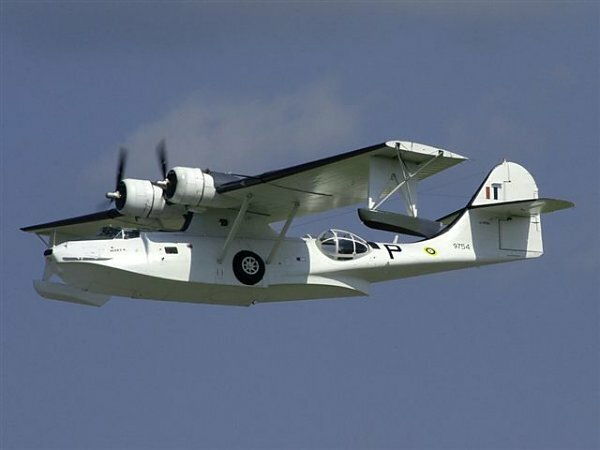 Having just returned from active duty in Iceland patrolling for German U-boats during the last months of WW2, the giant PBY Canso flying boat, serial number 11023, was now part of the Rockcliffe based No.162 Squadron which specialized in photo reconnaissance. 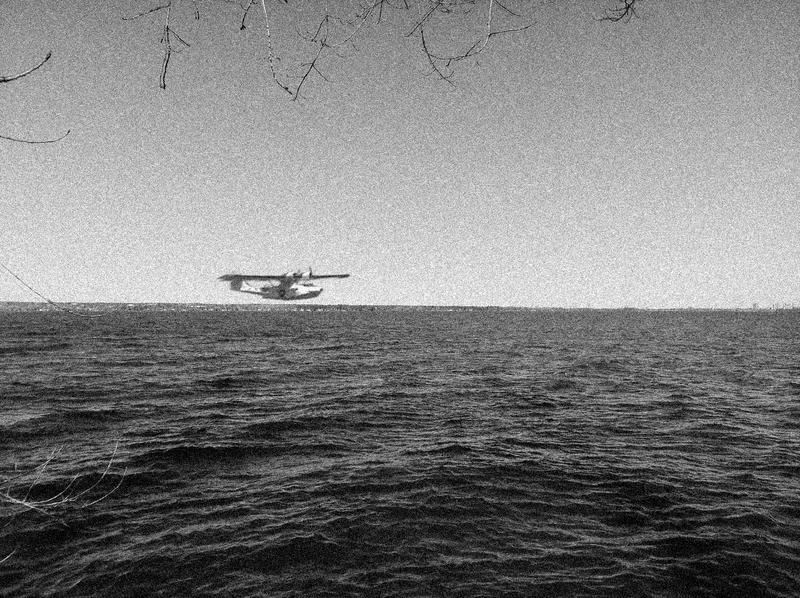 Originally built in Montreal in 1943 at the Vickers Canada factory, the 100 foot wingspan radial twin-engined flying boat was conducting practice take-off and landings in Lake Deschenes, a body of water that stretches north upriver from Britannia Bay. The amphibious PBY-Canso sitting in the water showing its large stature. The still, calm waters may have seemed pleasant for the many boaters and swimmers in the area, but proved deadly for the floatplane since the surface can be like smooth cement at high speed. This is thought to have contributed to what happened next. The plane took off without incident near the shores of Aylmer and circled over Shirley’s Bay, dropping low to land heading towards Britannia Beach. Suddenly the still, glassy water caught the plane in a disastrous manner, tearing off part of the wing, flipping the aircraft over and tearing a gaping hole into the hull. Listing to one side with 5 of the 7 man crew still inside and 2 men thrown clear of the aircraft, the plane quickly filled with water. Shocked cottagers watching the incident from their lawn chairs quickly jumped into their boats and sped towards the crash to assist in retrieving survivors from the wreckage. Within a minute the hull had slipped sideways into the depths of the river, tipping the 100 foot wing on end, like a massive sail sticking straight up out of the water. Two men trapped inside desperately tried to free themselves from the sinking wreck, but within minutes the aircraft submerged, taking all those still aboard with it. Two of the crew were pulled from the water into waiting boats as an RCAF crew member in a nearby boat courageously jumped into the water trying to reach the submerging plane in a desperate attempt to free those trapped underwater. AC Nightingale would later be awarded a medal for his bravery trying to save the doomed crew members. The plane quickly dropped into the murky depths and sadly no one else could be saved. The wreckage of the Canso settled and sank into the muddy bottom of the river where it would remain for several days. Cutaway of the Canso showing the various crew compartments. Pieces of the plane, equipment, fuel, oil, log books and other remnants floated to the surface as well as a few of the dead crew members. Divers tried to recover the remains of the crew members still inside but were hampered by the muddy silt now enveloping the plane. A tug boat was hired to attach cables and chains to pull what was left of the Canso to shore in Aylmer where it was hauled out of the water. The salvaged remains of the once mighty flying boat were then transported to Trenton, ON No.6 Repair Depot where records show it was catalogued as “scrap” and never heard from again. 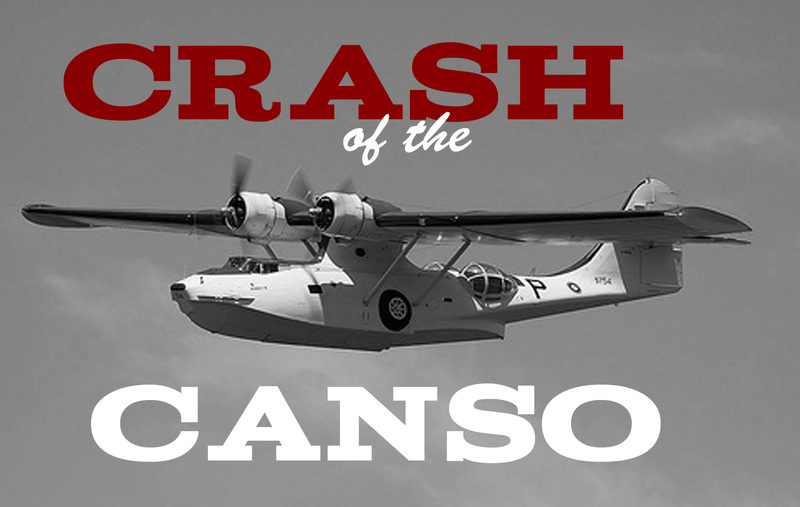 Does Canso 11023 still exist in a scrapyard somewhere? Is this tragic piece of history sitting in a junkyard, its story slowly becoming lost in time? It is unclear if the remaining underwater wreckage of the ill-fated Canso were ever recovered from the depths of Britannia Bay. If the plane broke apart upon impact it is likely that pieces still remain on the bottom today, covered in almost 70 years of silt and mud. The Canadian Warplane Heritage has a flying example of the Canso that operates out of Hamilton, ON. The Canadian Aviation and Space Museum here in Ottawa has a complete un-restored example of this unique flying boat in their collection and the Canadian Warplane Heritage in Hamilton, ON has a flying example of this famous U-boat hunter that once patrolled the waters of the North Atlantic. 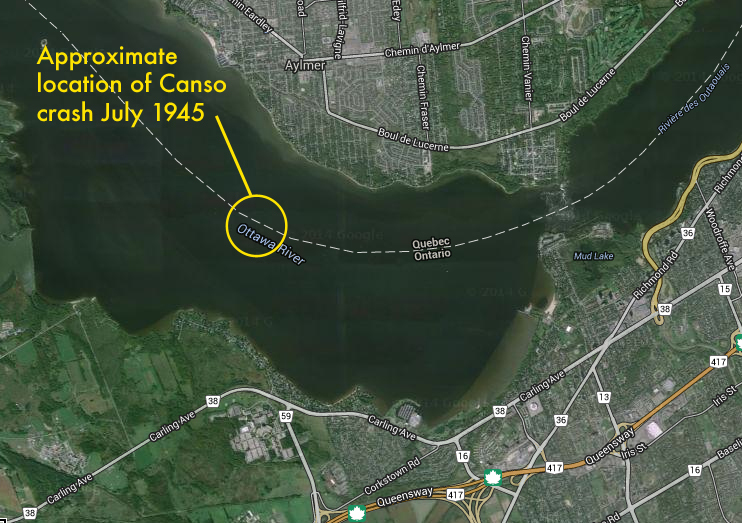 Perhaps one day we will search below the waters off Britannia and recognize the plane and the crew that slipped below the calm waters of the Ottawa River on that hot summer’s day in 1945. The history of Canada’s National Capital Region is always filled with stories of endurance and perseverance, of overcoming great obstacles in an undeveloped land consisting of forest and swamps. The first settlers in the Ottawa region came to an area inhabited by nomadic native Algonquin tribes with no real permanent structures, a land that was a clean and fresh piece of Canadian wilderness. So what was the first permanent structure to be built in our Nation’s Capital, who built it and where was it? Maybe an even bigger question can be asked: why is it not marked as a significant historical landmark in our capital region? History tells us that the first non-native settler to set up permanent residence was a fellow by the name of Philemon Wright. With most of Canada being settled by the French and British, it only seems logical that the first settlement in the Nation’s Capital would be built by someone from either of those nationalities. Surprisingly, that is not the case. The first permanent settlement in Canada’s Capital was built by an AMERICAN. American ex-patriot Philemon Wright left Woburn, Mass. in 1800 with his wife, children and 45 others to settle what is now the National Capital Region. Philemon Wright was an American who lived in Woburn, Massachusetts and dreamed of leaving the growing suburb of Boston for a new land, to create a prosperous new life in a fresh, untouched part of the continent. That part of the continent was the the unsettled land of Ottawa/Hull, a land that was being divided and given to men who would make it what it is today. Having fought against the British during the American Revolution, Wright knew it would not be an easy task to secure land now under British control. Lucky for Wright, British authorities at the time were seeking to populate the vast new lands of their colonies. 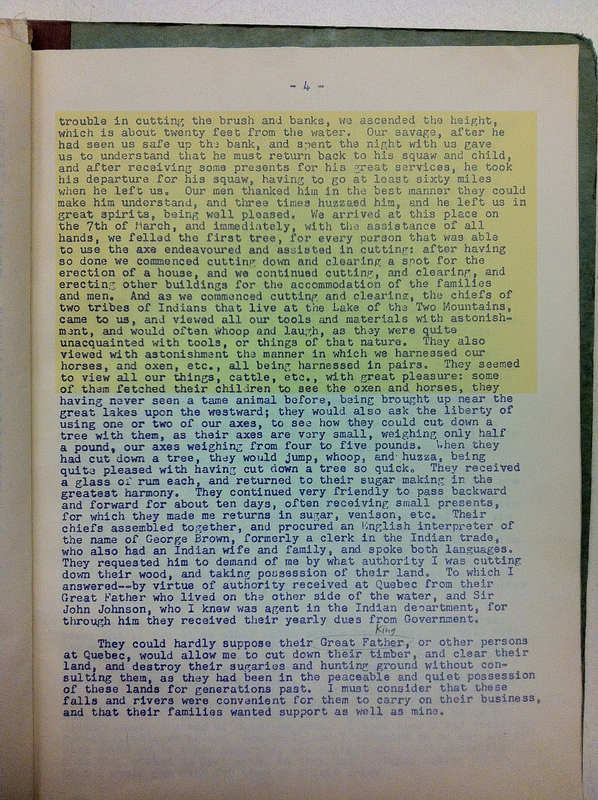 They arranged a program to have group settlements in the wilds of Canada. Interim land grants were given to leaders and associates, then the associates would hand over portions of their land grants to the leader as payment to the leader who did the exploration and surveying. One of these leaders was Philemon Wright, who visited Lower Canada often, specifically the area of Ottawa/Hull. After numerous visits to this area, he applied for a land grant to the British Empire. They approved his grant for a land settlement in this unknown land west of Montreal under one condition: Every adult male in his settlement must swear an oath of allegiance to the His Majesty, the King of the British Empire. 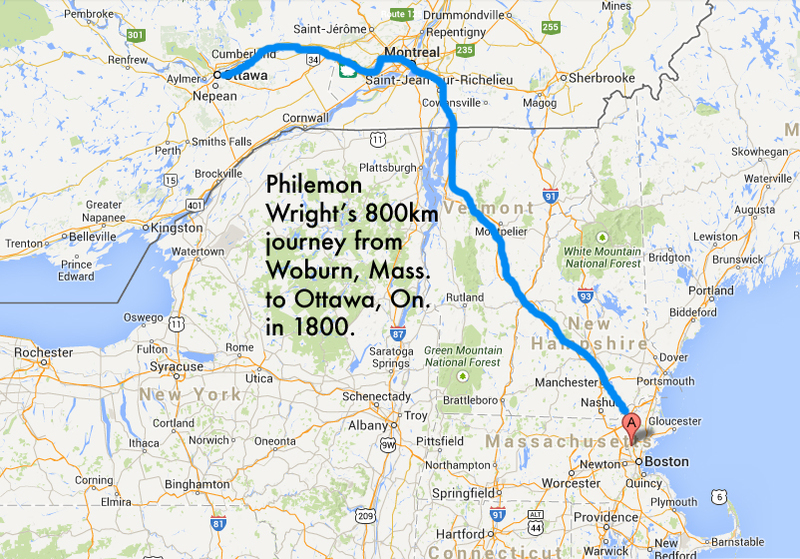 Wright’s 1800 journey northward from Massachusetts to Ottawa. He convinced a number of his Woburn neighbours and family members to sign over their land grants to him, and join him as “associates” on a journey north to settle a land no other European had settled. With 50 men, women and children, labourers and axemen, Wright set off in horse-drawn sleighs in February of 1800 for Montreal. Arriving in Montreal in March, Wright and his men swore allegiance to the King Of England and received their land grant for an area where three rivers met, the Ottawa, the Rideau and the Gatineau. His land was to become what is now Lac Leamy Park. 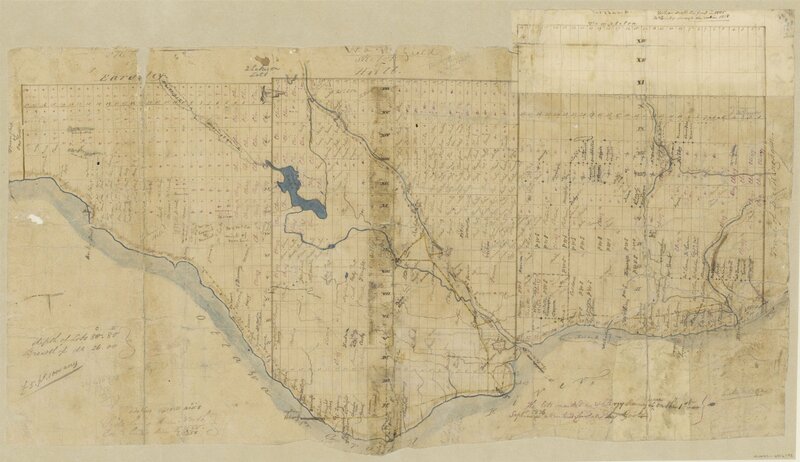 A map from 1836 that shows Philemon Wright’s land grant. Crossing the frozen waters of the Ottawa River, Wright and his settlers arrived on the shores of the Gatineau with the aid of an Algonquin guide, who showed them safely to their new home. Philemon and his crew went up the steep embankment 20 feet from the shore and began to clear the area of trees, using felled logs to construct what would become the very first permanent home in the National Capital Region. Wright had soon cleared the land and built a farm, and also a road to the Chaudiere Falls where he built the first mill and began a logging empire that continued for over a hundred years. Wright moved from his log cabin to a new home he built in Wrightstown, the town named after him that sprung up around his mill at Chaudiere Falls that would later be re-named Hull. In 1835 he sold his original home and farm, which he called Columbia Farm, to Andrew Leamy, which the area and lake are currently named after. A map showing both Wright’s and Leamy’s properties. 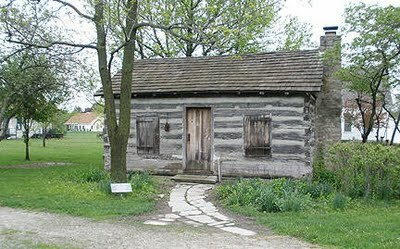 So now that we know where Wright landed and built his log cabin, what is left, if anything, of this original settlement? Old maps show his land and Columbia farm, and the original farm road is still in existence, although abandoned. 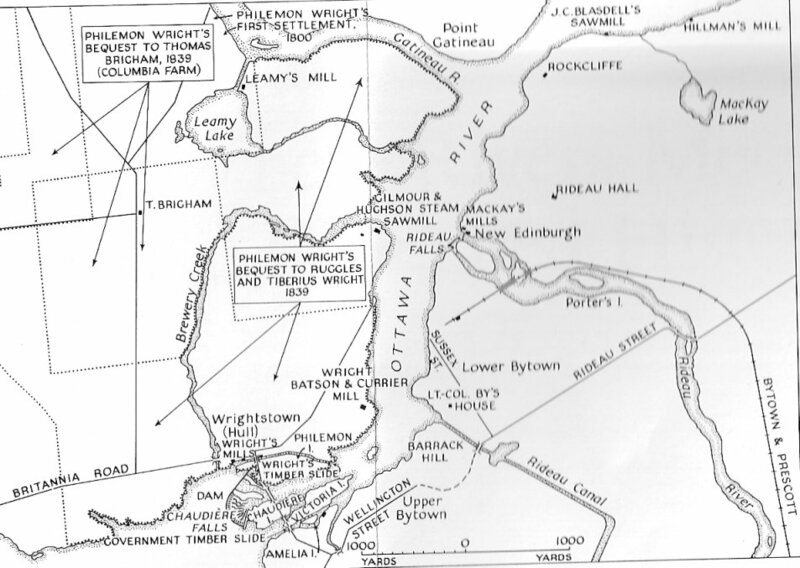 The majority of Wright’s settlement is on NCC land at Lac Leamy Park in what is now Gatineau. 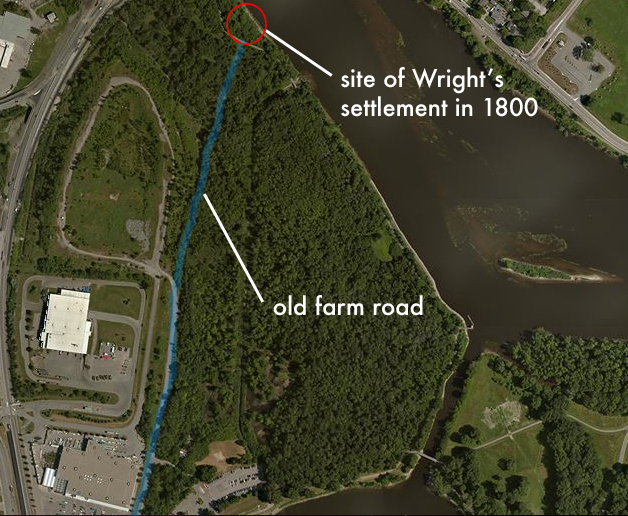 The original Wright farm road, which led from his original log house to his prosperous mill over by Chaudiere Falls partially remains, but what of the original cabin from which the road led to? 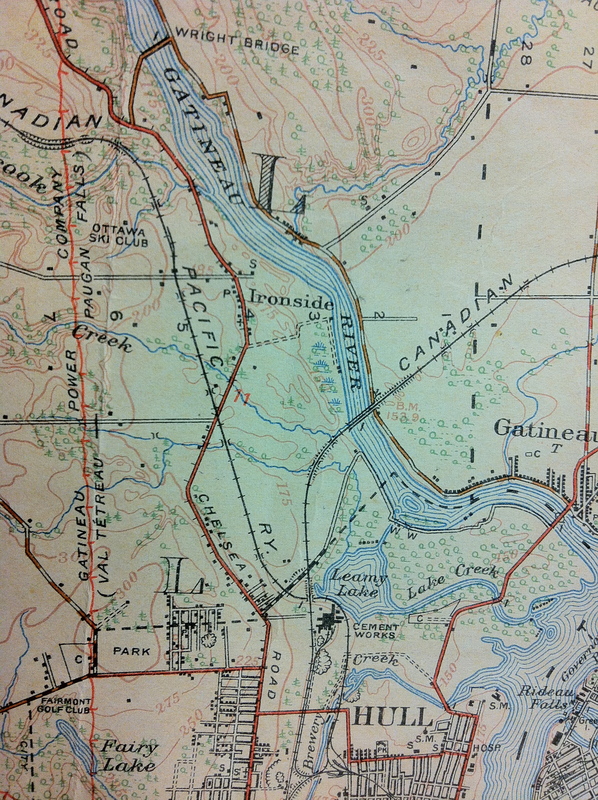 Looking at old maps from the Ottawa Public Library, Wright’s personal memoirs of the first settlement, and researching various NCC and historical information about the area, we can put together a pretty good picture of what was and is there now. 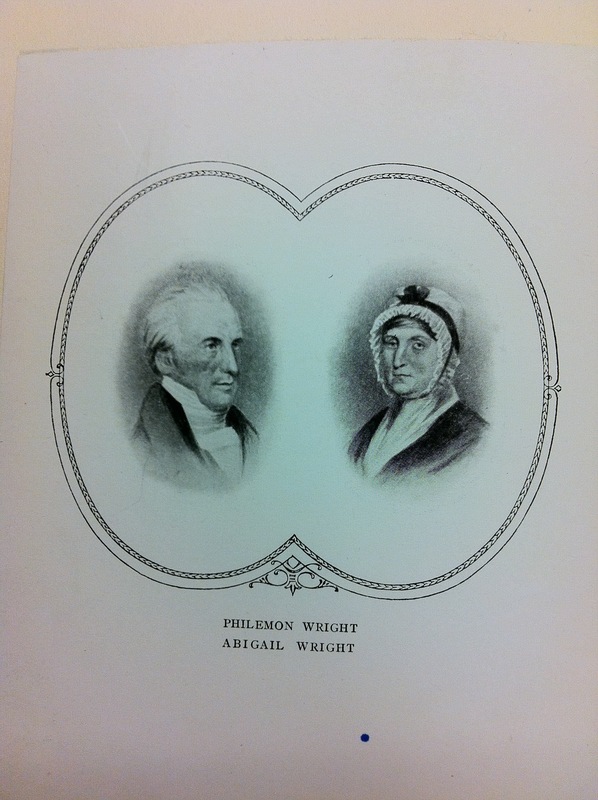 1820 personal account by Philemon Wright of his first settlement twenty years earlier. A similar style log cabin to the one Wright built on the banks of the Gatineau River in 1800. Using old maps we can see a variety of structures and the general area where Wright’s cabin could be located. NCC archeological documents identify a Wright dig site that was examined as file Name “Bi-Fw-24”. Using that code name, we can zero in on documents that reference that name. Recent STO transit studies that converted the nearby train tracks into a RapidBus transitway had an archeological assessment done and they identify the Wright home in their report. That NCC archeological investigation was in 2006. No marker, plaque or commemoration has been displayed since. A Department Of Defence map from 1935 shows a structure, most likely the Wright cabin or a building from his homestead, at the end of the original farm road. 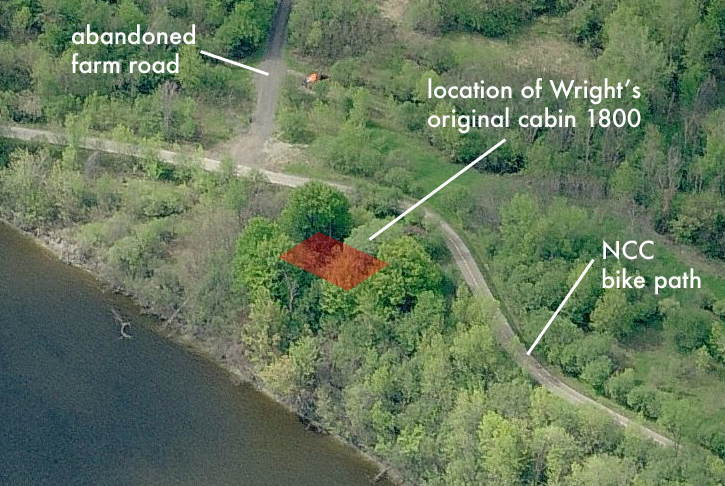 Ghosting images together of these old maps with current aerial imagery provides us with accurate locations from which to investigate possible remains of Wright’s cabin. 1935 Department of Defence map showing building at the end of the Wright farm road. Close-up of 1935 map ghosted over current map. Packing a camera and a GPS, I was determined to locate this incredibly important piece of Canadian history. Joined by fellow history buff and friend Glen Gower, we headed out to see what we could find. The original old farm road, which is likely one of the oldest roads in the region, was easily located and traversed. 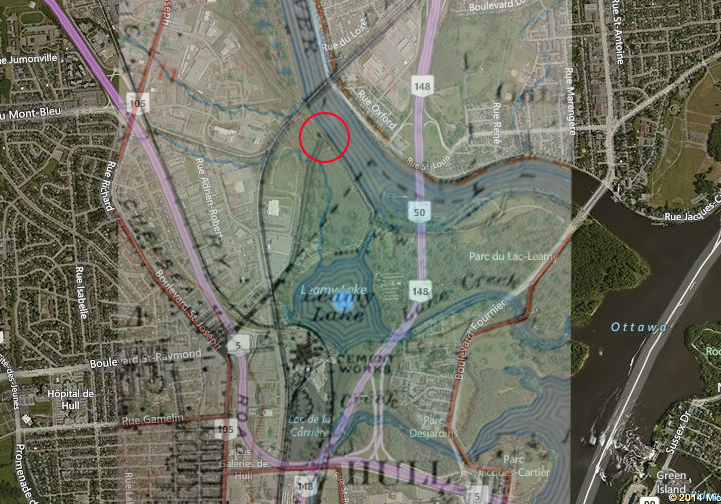 Using GPS coordinates from the map research, the location of Wright’s landing settlement was established and a survey of the area was conducted. 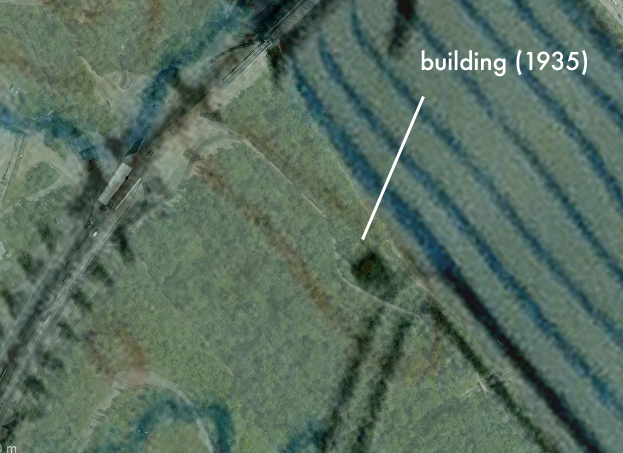 The farm road ended at what is most likely the site of Wright’s house. The area was searched and some clues were found. 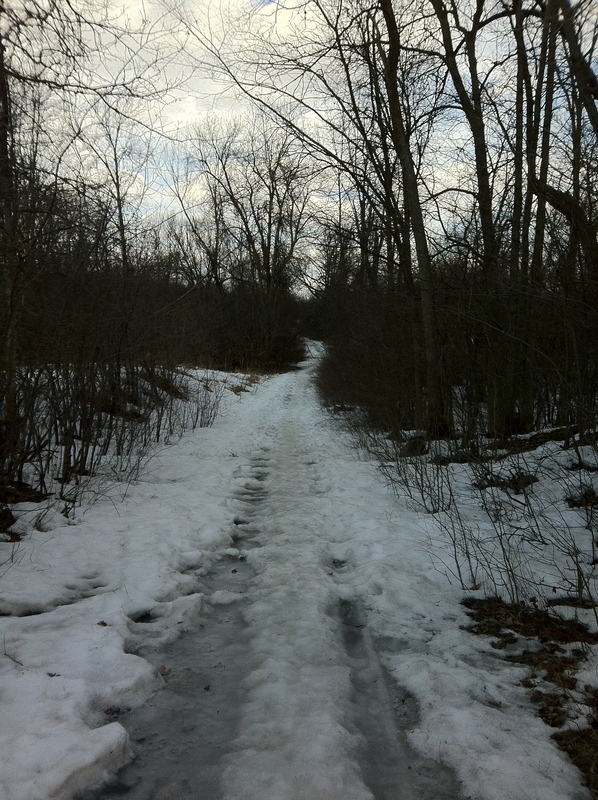 The abandoned Wright farm road leading to the site of his original cabin, possibly the oldest in the Capital Region. An overgrown trench had been previously dug across the area, which is a common archeological technique when investigating a site. 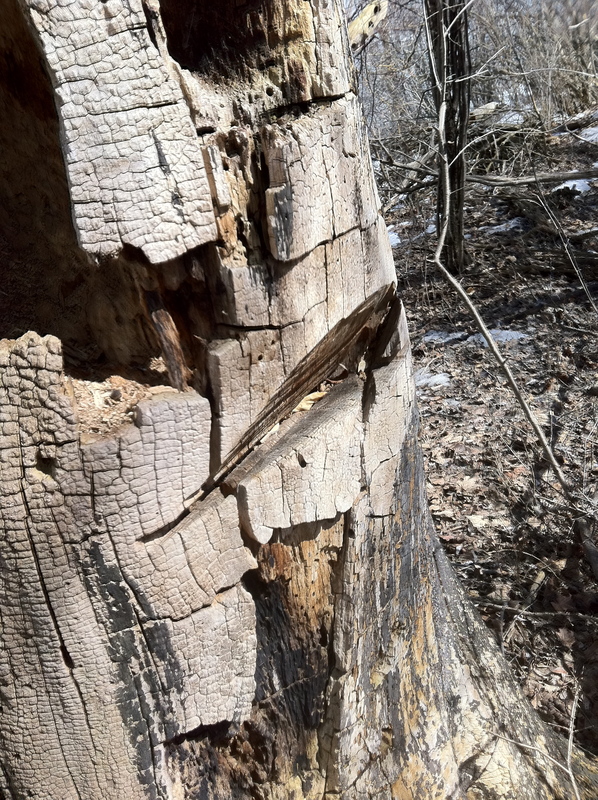 Axe marks were found on large, dead trees in the vicinity. Whether these are from 1800 when Wright’s axemen were clearing the land, or recent chainsaw marks has yet to be determined. 1800 axe marks or chainsaw on this old dead tree? A mass of tumbled stones on the site could be remnants from the first settlement. 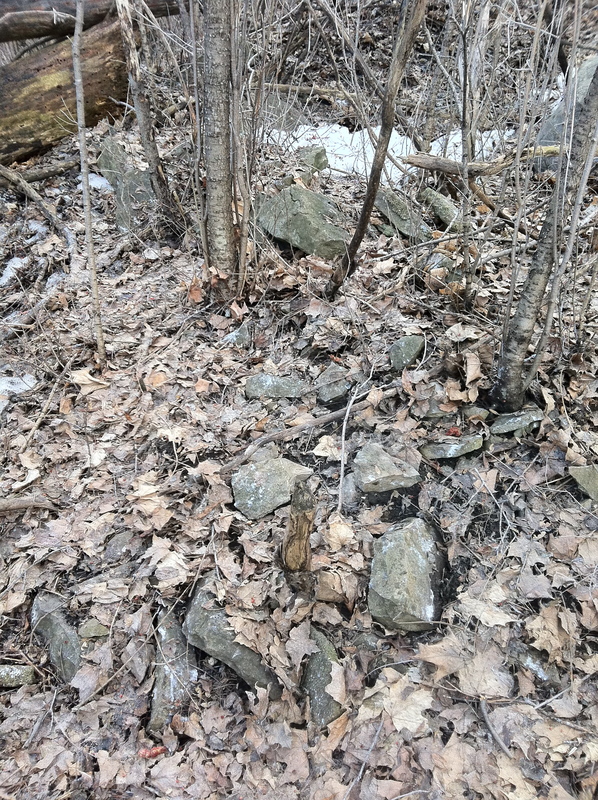 A mass of stones tumbled over an area of about 8-10 feet were discovered. This could possible be fireplace or foundation remains from the original cabin. Also noted was a deep pit dug into the ground nearby that may have been the outhouse latrine or a well. 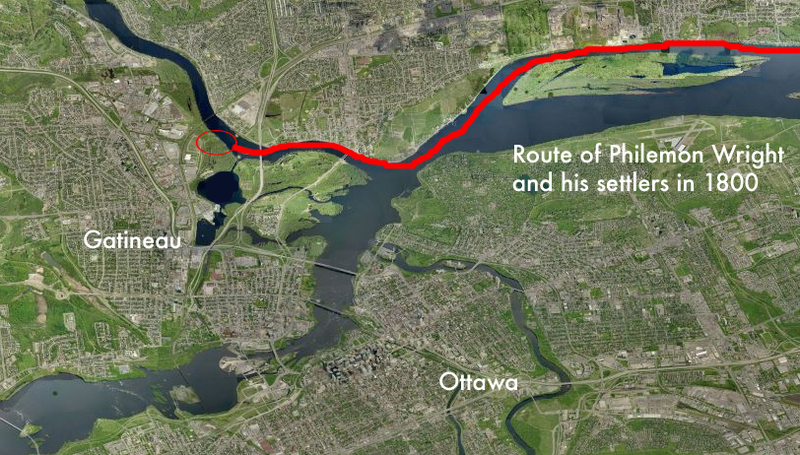 In comparing the site to Wright’s notes, the area is indeed set back 20 feet from the shoreline of the Gatineau River, atop a steep embankment as he described. Wright’s description of the initial landing on a steep bank of the Gatineau River. Considering these clues, the maps, the archeological reports, and comparing to Wright’s own memoirs about the site, I can almost certainly conclude this site, a barren, overgrown, area off an NCC bike path, is the resting place of the very first home built in the National Capital Region. If not exactly there, it is very near by. It seems a shame that no marker or plaque commemorates the spot where our Capital was born.What’s even more bizarre is the fact that in 1980, the NCC and US State representatives erected what was the largest free-standing cast plaque in North America commemorating Wright’s settlement on the site of Wright’s original home….IN WOBURN, MASSACHUSETTS. The founder of Ottawa, Hull and Gatineau lies buried in a simple grave a few kilometeres away from his original home, but no plaque marks the inception point of what was to become Canada’s Capital Region. 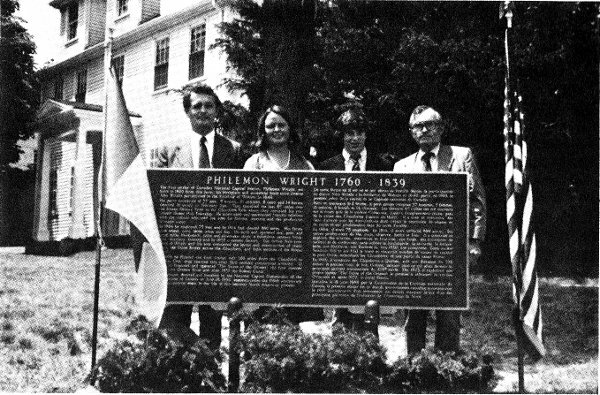 In 1980 a plaque, the largest free standing cast plaque in North America, was unveiled by the NCC and US State representative’s in Wright’s hometown of Woburn, Mass. Gravestone of Philemon Wright, just west of the Chaudiere Bridge. 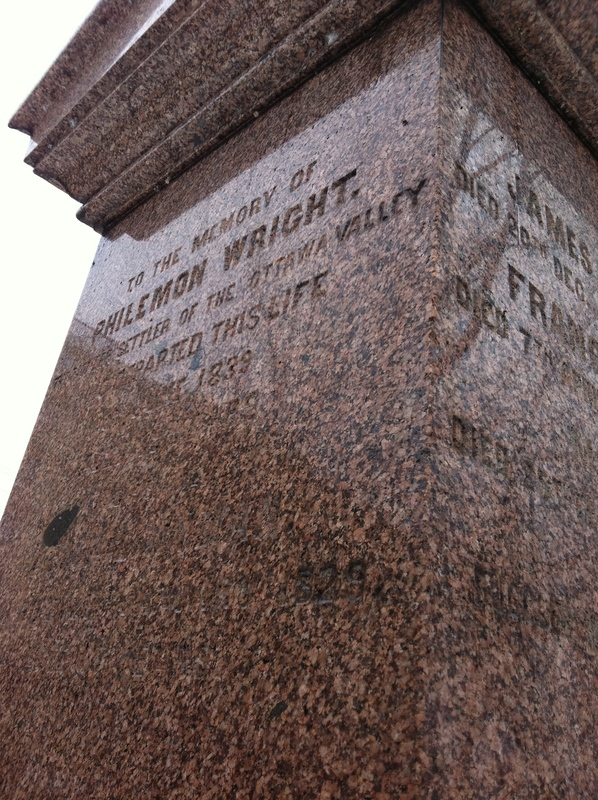 For whatever reason there is no plaque or any other indication of where Wright founded our city at the site. Whether or not it is because Wright was neither French nor British, but an American ex-patriot who founded the cradle of Canada’s Capital, this place is historically special and needs to be recognized. As a resident of this area I was saddened to stand on the spot where the man worked so hard to create a life for himself, who created a place that we call the National Capital Region, had nothing there to commemorate his efforts. Maybe because it is too remote, just a piece of overgrown NCC land in Gatineau, away from the downtown core, it remains ignored and forgotten. I would like to think that the legacy of Wright and what was our area’s first home, House One, will one day be made a place for all of us to visit, enjoy and remember in the years to come. 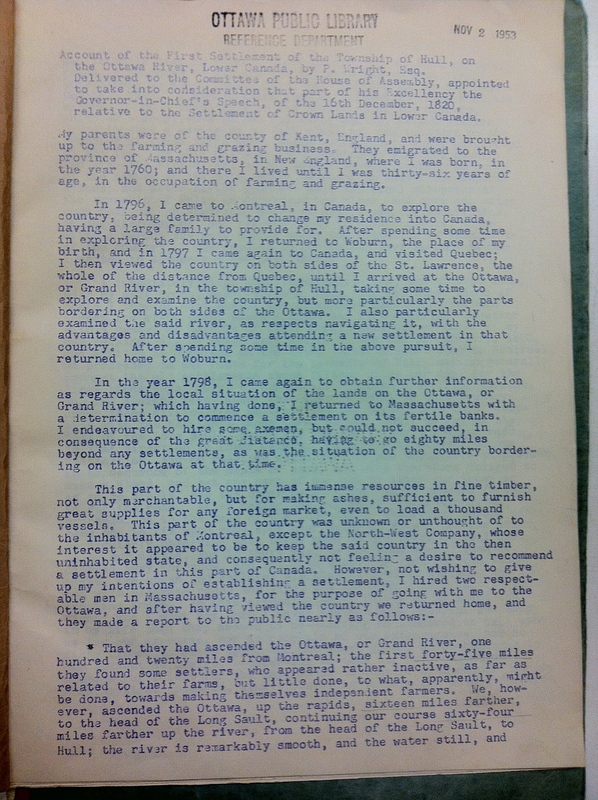 “Account Of The First Settlement Of The Township Of Hull, On The Ottawa River, Lower Canada”. By Philemon Wright, 1820. Ottawa Public Library.